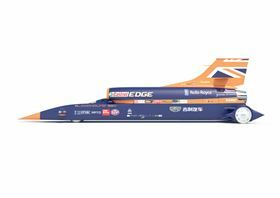 The Bloodhound is a supersonic car designed to break the world land speed record by reaching 1000 mph. Additive manufacturing (AM) company Renishaw has been named as a stripe sponsor for the car and an education sponsor for the Bloodhound project, a supersonic car designed to break the world land speed record by reaching 1000 mph. The sponsorship follows on Renishaw's work to 3D print a number of components on the car. The company created the titanium nose tip on its metal additive manufacturing system and has also additively manufactured the car's titanium steering wheel. ‘The car is an incredible feat of engineering and as the only UK manufacturer of metal additive manufacturing machines, it is fantastic to contribute to the iconic project both technically and financially,’ said Chris Pockett, head of communications at Renishaw. Renishaw Ibérica, 3D printing specialist Renishaw's subsidiary for the Spanish and Portuguese markets, has relocated to a new facility near Barcelona.